This Colour Count and Discover colouring book is a perfect side-by-side companion to the main Colour Count and Discover lesson book, but it can also be a stand-alone colouring book. 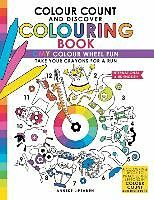 All fourteen wacky characters from the Colour Count and Discover CMY lesson book are assembled here to colour - alongside colour wheels for some extra colour fun. The CMY colour system - with Cyan Magenta and Yellow as primary colours - can be used in a fun and practical way - or children can simply choose their own colours and disregard the lesson component. The main book in print or Kindle format and the coordinating colouring book make a super gift pair. Take your crayons for a run! The CMY system is a good colour system to teach to young children, as it is used extensively in our modern world of commercial printing, paint mixes and inks for desktop printers. There are additional fun products and teaching materials - like posters and art aprons - that feature the little characters.